^ Wyatt, pp. 3–26. Wyatt argues that Clinton had mild neurosis and was unable to work with those whom he considered equal. ^ Cornwallis Papers, The National Archives. Retrieved 30 September 2008. ^ Germain Papers, Clements Library, An Arbor. Germain Papers Archived 2007年2月3日, at the Wayback Machine.. Retrieved 30 September 2008. ^ Sir Henry Clinton. Notable Names Database. Retrieved 23 September 2008. Bicheno, Hugh (April 2003). Rebels and Redcoats: The American Revolutionary War. Harper Collins. ISBN 0007156251. Billias, George Athan (1969). George Washington's Opponents. New York: William Morrow. OCLC 11709. Borick, Carl P. (February 2003). A Gallant Defense: The Siege of Charleston, 1780. University of South Carolina Press. ISBN 1570034877. Fredriksen, John C (2001). America's Military Adversaries: From Colonial Times to the Present. Santa Barbara, CA: ABC-CLIO. ISBN 9781576076033. OCLC 248864750. Gruber, Ira (1972). The Howe Brothers and the American Revolution. New York: Atheneum Press. OCLC 1464455. Hadden, James M; Rogers, Horatio (1884). A Journal Kept in Canada and Upon Burgoyne's Campaign in 1776 and 1777 by Lieut. James M. Hadden. J. Munsell's Sons. OCLC 2130358. http://books.google.com/books?id=3RO2nofuok4C&pg=PA375#v=onepage&f=false. Harvey, Robert (May 2002). A Few Bloody Noses: The Realities and Mythologies of the American Revolution. Overlook Hardcover. ISBN 1-58-567273-4. Hibbert, Christopher (April 2002). Rebels and Redcoats: The American Revolution Through British Eyes. W.W. Norton. ISBN 0-39-332293-9. Lengel, Edward (2005). General George Washington. New York: Random House Paperbacks. ISBN 9780812969504. OCLC 255642134. McEvedy, C. (1988). The Penguin Atlas of North American History to 1870. Penguin. ISBN 0-14-051128-8. Mintz, Max M (1990). The Generals of Saratoga: John Burgoyne and Horatio Gates. New Haven, CT: Yale University Press. ISBN 9780300047783. OCLC 644565187. Russell, David Lee (2002). Victory on Sullivan's Island: the British Cape Fear/Charles Town Expedition of 1776. Haverford, PA: Infinity. ISBN 9780741412430. OCLC 54439188. Willcox, William (1964). 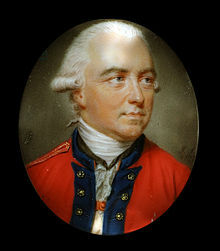 Portrait of a General: Sir Henry Clinton in the War of Independence. New York: Alfred A Knopf. OCLC 245684727. Wilson, David K (2005). The Southern Strategy: Britain's Conquest of South Carolina and Georgia, 1775–1780. Columbia, SC: University of South Carolina Press. ISBN 1570035733. OCLC 56951286. Wyatt, F. (January 1959). “Sir Henry Clinton: a Psychological Exploration in History”. William and Mary Quarterly 16 (1): 3. doi:10.2307/1918848. Buchanan, John (February 1997). The Road to Guilford Courthouse: The American Revolution and the Carolinas. John Wiley and Sons. ISBN 047116402X. Clement, R. (January–March, 1979). “The World Turned Upside down At the Surrender of Yorktown”. Journal of American Folklore 92 (363): 66–67. Ferling, John (October 1988). The World Turned Upside Down: The American Victory in the War of Independence. Greenwood Press. ISBN 031325527X. Hyma, Albert (1957). 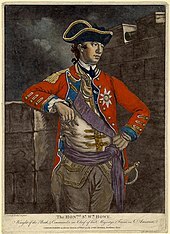 Sir Henry Clinton and the American Revolution. Hyma. Leckie, Robert (1993). George Washington's War: The Saga of the American Revolution. New York: HarperCollins. ISBN 9780060922153. OCLC 29748139.